You want the networks to pay money to you but you don´t want to give your real information? If you don´t want to use your real personal information I recommend to don´t sign up for any network at all. (2016-05-10, 01:31 AM)HansPeter Wrote: You want the networks to pay money to you but you don´t want to give your real information? Well, my previous network doesnt had any problem with that. Also why should any network need my personal information? hop back to your previous network, or just sign up with real information. For the money withdraw u will need to fill in personal information too,. 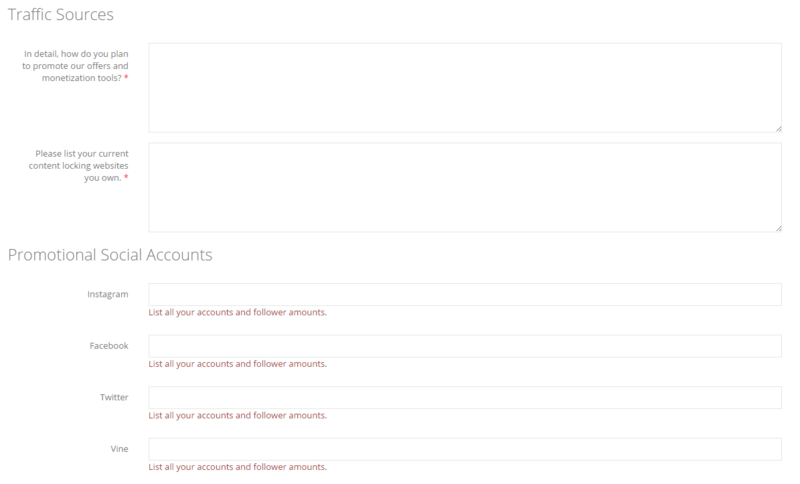 First,Fill in real information for your account. Provide some traffic sources that your product,content,link lockers or direct offers are coming from like Facebook pages, twitter and etc. You need to provide your real info when signing up with networks. It is like applying for real job IRL. If you want to be accepted than use real info and be honest. Also if you are from Vietnam than you have a problem if you don't prove you have legit traffic (attach some earnings proofs,etc). Thank you guys, WarAffiliate made it clean. Also last question. Does someone know if ogads got paypal payments? (2016-05-10, 04:28 PM)thexamx Wrote: Thank you guys, WarAffiliate made it clean. Yes you can get your payment by PayPal.